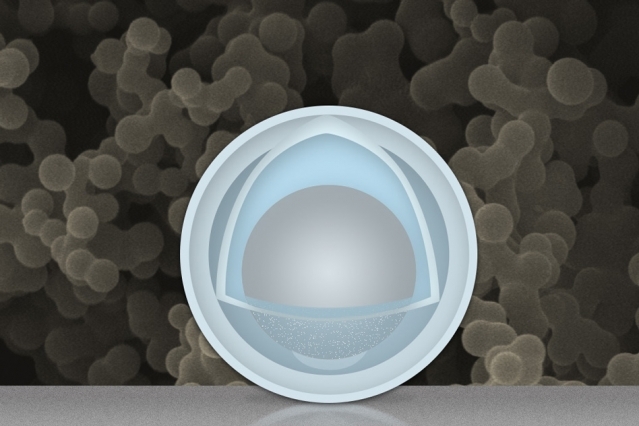 A new “yolk-and-shell” nanoparticle could boost the capacity and power of lithium-ion batteries. Dr. Yi Cui and teams at Stanford’s National Accelerator Laboratory (Formerly the Stanford Linear Accelerator Center), and the Environmental Molecular Sciences Laboratory (EMSL) at Pacific Northwest National Laboratory all published papers on a similar joint accomplishment three years ago, as reported in this blog. Dr. Cui had studied several alternative ways to reduce the effects of expansion and contraction on electrodes. 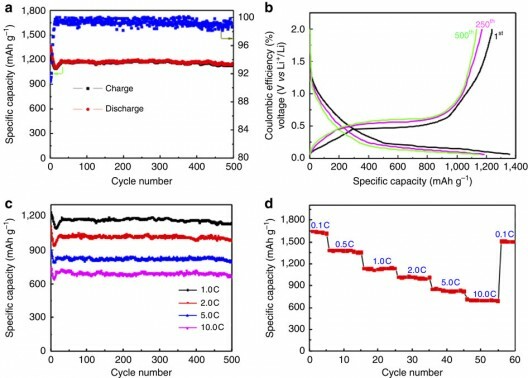 The MIT researchers explain that most lithium-ion batteries have graphite anodes with a storage capacity of 0.35 ampere-hours per gram (Ah/g). Looking at alternatives, lithium metal can store about 10 times as much energy per gram, but, according to the researchers, is extremely dangerous, short-circuiting and catching fire on occasion. Silicon and tin have very high capacity, which drops at high charging and discharging rates. Aluminum is a low-cost option with theoretical capacity of 2 Ah/g, roughly six times that of carbon. But Li found much the same thing Cui did with silicon, it expands considerably when charged to high capacity, and absorb lithium, then shrink when discharging and releasing lithium. Repeated expansion/contraction cycles cause mechanical stress, and break down the electrodes. Complicating things further, liquid electrolyte in contact with aluminum decomposes and forms a solid-electrolyte interphase (SEI) layer around the Al, which sheds particles when charged and discharged. This has caused previous attempts to use aluminum in Li-ion batteries to fail. MIT’s titanium oxide shell separates the aluminum from the liquid electrolyte, and does not expand or contract much, stabilizing the SEI layer and protecting the aluminum inside from direct contact with the electrolyte. This was an unplanned outcome. 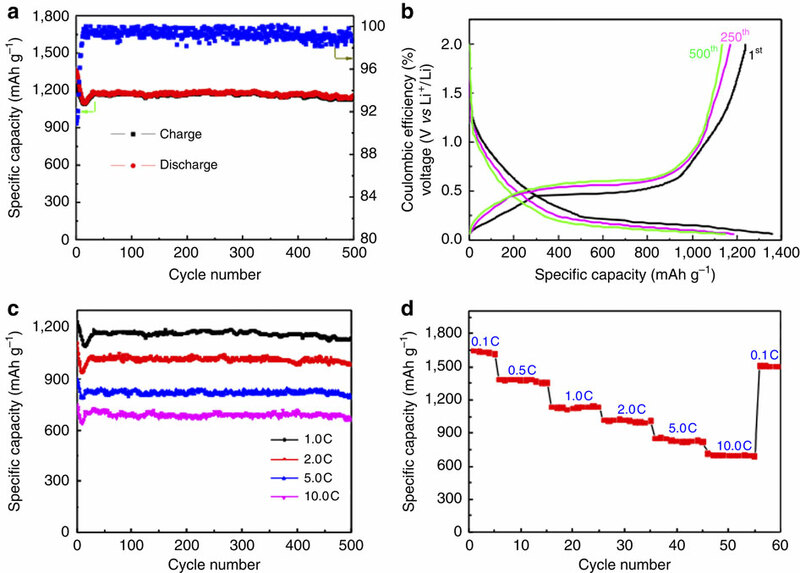 Converting the alumina layer to a thin layer of titania (TiO2) gave a better conductor of electrons and lithium ions. Reacting Alumina with sulfuric acid released excess water which reacted with titanium oxysulfate to form a solid shell of titanium hydroxide with a thickness of 3 to 4 nanometers. After further treatment, the particles are then tested through 500 charging-discharging cycles. Thickening the titania shell. The inside of the electrode, though, remains clean with no buildup of SEIs, “proving the shell fully encloses the aluminum while allowing lithium ions and electrons to get in and out.” The resulting electrode gives more than three times the capacity of graphite (1.2 Ah/g) at a normal charging rate, Li says. At very fast charging rates (six minutes to full charge), the capacity is still 0.66 Ah/g after 500 cycles. With inexpensive materials and a simple manufacturing process that could be easily scalable, Li says, “It’s probably the best anode material available” for applications that require a high power- and energy-density battery. Full cell tests using lithium iron phosphate as cathode have been successful, indicating ATO is quite close to being ready for real applications. That cathode would be a further protection against thermal runaways. The research team included Sa Li, Yu Cheng Zhao, and Chang An Wang of Tsinghua University in Beijing and Junjie Niu, Kangpyo So, and Chao Wang of MIT. The work was supported by the National Science Foundation and the National Natural Science Foundation of China. Li is Battelle Energy Alliance Professor in Nuclear Science and Engineering, who has a joint appointment in MIT’s Department of Materials Science and Engineering. MIT’s and Tsinghua University’s work is published in Nature Communications.